Peter Buck of Red Bull discusses marketing with chamber members. Recognizing that the majority of consumers use online searches to find products and services, we maintain a business directory that is easy to use and contains trusted local businesses. Our search engine optimized websites provides a dynamic marketing platform for all our members and inclusion on the site is a benefit of being a Chamber member. Our sites receive heavy traffic from our local valley citizens as well as the million plus visitors we receive every year. In addition to offering the public an interactive business directory, our web pages feature a community calendar, coupon and promotion pages, news and content. The Chamber can also assist with your social media efforts, press releases, and short video clips for promotion. 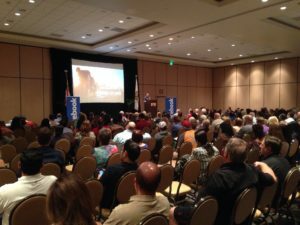 Annually we invite major speakers into the market such as Facebook, Google, LinkedIn and other media giants to explain their platform and help you understand marketing strategies for your business. 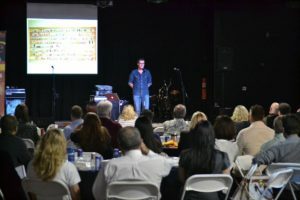 The Greater Coachella Valley Chamber also offers numerous opportunities to connect directly with the local community. We host over 30 major events a year, and 150 plus events total. No matter who your target audience is, we can help put you in front of them. If you are a Chamber member looking to take full advantage of the Chamber benefits you receive, schedule a visit with one of our Core Services team. Juan Salazar of Facebook presents to our chamber members.